For other uses, see Papa, Scotland. 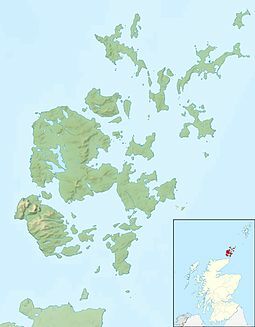 Old Norse for "big island of the papar"
Papa Westray, also known as Papay, is one of the Orkney Islands in Scotland, United Kingdom. The fertile soil has long been a draw to the island. Attractions on the island include Holland House with an associated folk museum and the Knap of Howar Neolithic farmstead run by Historic Scotland. It is the ninth largest of the Orkney Islands with an area of 918 hectares (2,270 acres). The island's population was 90 as recorded by the 2011 census, an increase of over 35% since 2001 when there were only 65 usual residents. During the same period Scottish island populations as a whole grew by 4% to 103,702. Orkney Ferries sail MV Golden Mariana from Papa Westray to Pierowall and Rapness on Westray, and Kirkwall on the Orkney Mainland. Britten-Norman Islander aircraft operated by Loganair fly from Papa Westray Airport to Westray and Kirkwall; the hop from Papa Westray to Westray is the world's shortest scheduled flight, at approximately 2 minutes. At the northern tip of the island lies North Hill. At 49 metres (161 ft), it is the island's highest point and an RSPB nature reserve. Many seabirds breed on the island, including Arctic terns and Arctic skuas. It was one of the last places where the great auk was found; the last individual was killed in 1813. The reserve is also home to the rare and tiny purple-flowered Scottish primrose Primula scotica. The sea of the island is a Marine Protection Area. 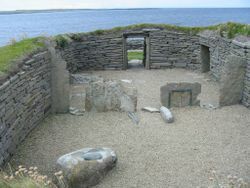 The Knap of Howar Neolithic farmstead (Historic Scotland; accessible at all times) is the oldest preserved house in northern Europe, dating from around 3500 BC. The homestead, which consists of two roughly rectangular stone rooms side by side, linked by an internal door, and with doors to the outside at the west end, is partly subterranean, and virtually complete to roof height. Examples of the round-bottomed Unstan ware have been found here, and provided the key to dating the settlement. According to tradition, in the 8th century AD, the Pictish King Nechtan attempted to seduce a young woman from the island named Triduana, who in response gouged her own eyes out. She later became abbess of a nunnery at Restalrig, now part of Edinburgh, and was in due course canonised as St Tredwell. A chapel was consecrated to her on Papa Westray and became a place of pilgrimage for people with eye complaints. The two Papeys, the great and the little (anciently Papey Meiri and Papey Minni), [are] now Papa Westray and Papa Stronsay ... Fordun in his enumeration of the islands, has a 'Papeay tertia' [third Papey], which is not now known. There are three islands in Shetland called Papey, and both in Orkney and in Shetland, there are several districts named Paplay or Papplay, doubtless the same as Papyli of Iceland. Also on the island is the 12th-century parish church of St Boniface (recently restored; open in summer) with a carved Norse "hogback" gravestone (probably also 12th century) in the churchyard. This stands on a substantial and largely unexcavated 9th century, or earlier, Pictish religious site – possibly including a bishop's residence. Remains of a heavily eroded broch can be seen on the shore. Early Christian carved stones, which may date from as early as the 7th century AD, found at this site are on display in Orkney Museum in the Tankerness House, Kirkwall and the National Museum of Scotland, Edinburgh. These may be the earliest evidence for Christianity to survive in the Northern Isles. 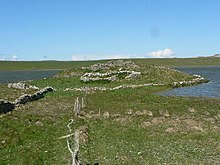 Another ancient monument that can be visited is a well-preserved Neolithic chambered cairn on the small island of Holm of Papa Westray, a little east of Papay itself (and readily visible from the larger island). The long, stalled cairn, built of local stone, was once a communal burial place for the bones of an ancient community. It is protected by a modern roof and entered by a man-hole from above. This can be seen at any time of day, but visitors must arrange privately for a boat through the local co-op. Papa Westray is the birthplace of the Orcadian educator and man of letters, John D. Mackay. The remains of St Tredwell's Chapel stand on a conical mound on a small peninsula (about 4.5 metres high and 35 metres across at the water level) in St Tredwell's Loch. The remains of the late medieval walls can be seen, built over Iron Age remains, including an underground tunnel leading to a circular building or broch. The thick walls of the chapel and records of tracery work indicate an important and well-founded establishment. The chapel was surveyed by Sir H. Dryden in 1870 when its walls, of variable thickness, were still up to 6 feet high and the interior measured 20 ft 3in by 13 ft 10ins. The chapel was cleared of rubble by William Traill around 1880. He found 30 copper coins dating between the reigns of Charles II and George III under the chapel floor, along with a female skeleton. People used to come to it from other isles; before the chapel door was a heap of small stones, "into which the Superstituous People when they come, do cast a small stone or two for their offering, and some will cast in Money"; the loch is "held by the People as Medicinal"; "a Gentleman in the Countrey, who was much distressed with sore Eyes, went to this Loch and Washing there became sound and whole...with both which persons he who was Minister of the place for many years was well acquainted and told us that he saw them both before and after the Cure: The present minister of Westra told me that such as are able to walk use to go so many times about the Loch, as they think will perfect the cure before they make any use of the water, and that without speaking to any... not long since, he went to this Loch and found six so making their circuit..." "As for this Loch's appearing like Blood, before any disaster befal the Royal Family, as some do report, we could find no ground to believe any such thing. Such was the veneration entertained by the inhabitants for this ancient saint, that it was with difficulty that the first Presbyterian minister of the parish could restrain them, of a Sunday morning, from paying their devotions at this ruin, previous to their attendance on public worship in the reformed church. Wonders, in the way of cure of bodily disease, are said to have been wrought by this saint, whose fame is now passed away and name almost forgotten. ^ a b Area and population ranks: there are c. 300 islands over 20 ha in extent and 93 permanently inhabited islands were listed in the 2011 census. ^ a b c National Records of Scotland (15 August 2013) (pdf) Statistical Bulletin: 2011 Census: First Results on Population and Household Estimates for Scotland - Release 1C (Part Two). "Appendix 2: Population and households on Scotland’s inhabited islands". Retrieved 17 August 2013. ^ a b Haswell-Smith, Hamish. (2004) The Scottish Islands. Edinburgh. Canongate. ^ Ordnance Survey: Landranger map sheet 5 Orkney (Northern Isles) (Map). Ordnance Survey. 2008. ISBN 9780319228111. ^ a b Anderson, Joseph (ed.) (1873) The Orkneyinga Saga. Translated by Jón A. Hjaltalin & Gilbert Goudie. Edinburgh. Edmonston and Douglas. The Internet Archive. Retrieved 26 August 2013. ^ a b c Keay, J. & Keay, J. (1994) Collins Encyclopaedia of Scotland. London. HarperCollins. ^ "Scotland's 2011 census: Island living on the rise". BBC News. Retrieved 18 August 2013. ^ "Final trip for Orkney shortest flight pilot". Working Lunch, BBC. Retrieved 26 May 2013. ^ "St Treadwell's Loch, Papay". Orkneyjar. Retrieved 26 August 2013. ^ "St Boniface's". Scottish Church Heritage Research. Retrieved 26 August 2013. 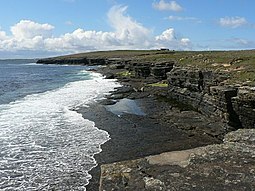 Wikimedia Commons has media related to Papa Westray. 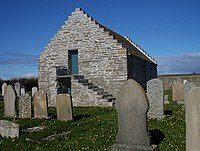 Wikivoyage has a travel guide for Papa Westray.